A total of 507 students will be candidates for graduation Saturday, May 13 when Cowley College holds its 94th Commencement exercises. Two hundred and ninety two of the students are expected to participate in the Commencement ceremonies. The featured speaker is Bill Docking, who is the Chairman of Union State Bank in Arkansas City and City Bank & Trust Company, Guymon, OK. He is also chairman, president and CEO of Docking Bancshares, Inc., and is president of Cowley County Broadcasting, Inc.
Members of Cowley’s Student Senate will address the class. Kelli Ailey, sophomore secondary education major from Newkirk, OK, served as Student Senate president during the 2016-2017 academic year. While, Kyrstyn Kinzie, a sophomore early childhood development major from Manhattan, KS, served as Student Senate vice president. 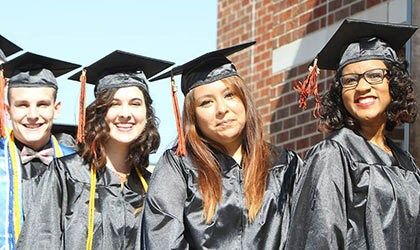 Students listed in the official Commencement program on Saturday, May 13 are candidates for the associate of arts degree, the associate degree of applied science, the associate degree of general studies, the associate degree of science, or the college certificate. The students include summer 2016 graduates through summer 2017 graduates. Students who graduated last summer and last December have received their diplomas. May 2017 graduates will receive their diplomas in June.